According to a new report published by Bloomberg, Apple’s long term plan is to move away from Intel developed chips for powering its Mac lineup of laptops and all-in-one PC and instead rely on chips that are designed in-house. Similar to the chips that currently power the Cupertino company’s iPhones and iPads. Apple started using Intel’s processors for its Macs in the year 2005, prior to which it relied on chips developed by Motorola Inc. and IBM Corp. 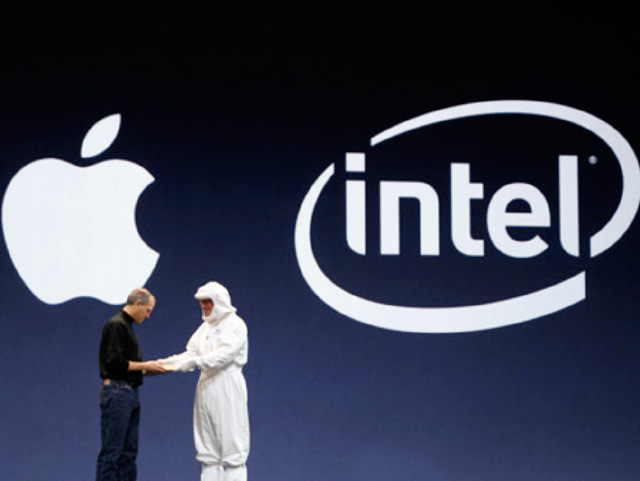 However, by this time around those chips were no match to Intel processors in terms of performance, compelling Apple to strike a partnership with Intel. The chips (the A5s and A6es) that power Apple’s mobile devices are all designed by its own team of engineers but the actual manufacturing is done by Samsung, a company Apple is not on good terms. So, it is likely that Apple would move to other OEMs such as Taiwan Semiconductor Manufacturing Co or even Qualcomm. If and when this shift from Intel to ARM based processors happens it will come as a severe blow to Intel, which is already failing to meet profit expectations. The present global trend is mobility. PCs are on the decline and so is Intel’s profit, which powers most of these PCs. Intel’s own move towards mobile computing with its Atom series of processors is yet to bear fruit and it cannot afford to lose a considerable section of its PC business to ARM based processors. All said, this news still remains a rumor and even if Apple does have such plans at the moment, it could change depending on how powerful Intel chips will be in, say five years. Intel is still the undisputed master of performance chip design and development and for Apple to replace Intel chips with ARM based chips it has to outperform or at least match Intel’s performance. Only time will tell.